A bill (HB987) that would substantially change laws controlling vacation rentals by preventing local governments such as Flagler County or Flagler Beach from regulating the industry cleared the second of three House committees today even though several lawmakers who voted for it voiced concerns with the bill in its present form, as did the bill’s own sponsor, J.W. Grant, the Hillsborough County Republican. Flagler County government, the Hammock community and Flagler Beach are closely monitoring bills in the House and Senate that could “preempt” local regulation of vacation rentals, reserving them to the state and thus eliminate regulations Flagler put in place in 2014 and Flagler Beach has had in place for many more years than that. The bill that cleared the Government Operations and Technology Appropriations Subcommittee today would create a “constitutionally protected” right for homeowners to rent their homes for short-term vacationers. The constitutional right would override the authority of deed-restricted communities such as homeowner associations from restricting or regulating vacation rentals. The bill would eliminate all grandfather clauses, thus eliminating dozens of local ordinances, including Flagler Beach’s and Flagler’s, that currently regulate the industry. And it would place all regulatory responsibilities in the hands of the Department of Business and Professional Regulation’s Division of Hotels and Restaurants. The bill cleared the Business and Professions Subcommittee previously. It has one more stop in the Commerce Committee before heading to the House floor. A companion bill in the Senate, SB 824, was on its first committee agenda on March 26, but was not heard. Hillsborough County Republican Rep. J.W. Grant speaking for his vacation-rental bill today before a subcommittee. The Legislature pre-empted all vacation-rental rules in 2011, with a grandfather allowance for ordinances pre-dating that year. Locally, the law triggered complaints in the Hammock, where residents neighboring properties used as vacation rentals charged that the character of their neighborhood was changing, and that they were made to live next to “mini-hotels,” as they frequently called the properties. Homeowners and vacation rental agents defended the practice on property-rights grounds. Airbnb and owner-occupied rentals gave the industry a further lift because of the economic incentive encouraging homeowners to lease their properties on short-term contracts. Flagler government lobbied legislators to regain some regulatory authority and succeeded in 2014, writing an ordinance that doesn’t prohibit short-term rentals but gives the local government licensing and inspecting authority. Ever since, lawmakers have been trying to repeal that law. They have fallen short every year in what has become one of the most controversial legislative battles of the last few years. According to a legislative analysis, there are 14,874 licensed vacation rental dwellings in the state, and another 6,000 vacation rental condominiums. Grant today said he recognized the “sensitivity” of the bill as he introduced it to the committee and assured committee members that it would still undergo “significant” work. “There are things that I do not like in the bill, there are things that other stakeholders do not like in the bill,” Grant acknowledged. But, he said, the bill is designed to police “bad-actor behavior” without taking property rights away from good actors. “DBPR will make this work,” he said. He described the bill as “a significant change from previous efforts,” though in the main, the bill hews to previous attempts in previous years to pre-empt local regulations, in much the same language. The majority of those who addressed the committee opposed the bill. That’s not necessarily an indication of where public or business sentiment is: many of those who favor the bill signaled their support in writing but chose not to address the committee, figuring further battles are ahead. Still, those who did speak stressed what they saw as the vulnerabilities of the bill, especially, for many, the absence of any provision that would preserve homeowner associations’ right to police their own. makes it very clear that this bill will place in conflict with those duly-adopted deed restrictions,” he said, which are adopted by supermajority of homeowners. “It will increase costs, because your associations will have to hire lawyers to defend themselves against claims that this bill creates a superior right, and in fact in the first section of this bill it creates a constitutional right, for those who choose to rent their homes on a short-term basis.” Others echoed Anderson’s concerns. 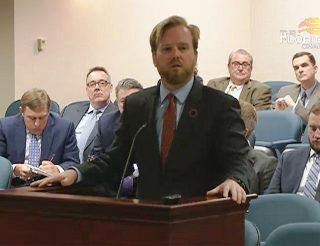 Casey Cook, who represents the Florida League of Cities, cast doubt on the Department of Business and Professional Regulation’s capability of monitoring and inspecting the industry, given its current workload, lack of staff and funds, what he described as “inaction.” The department inspected only 72 percent of hotels and motels last year, he said. It could never capably inspect vacation rentals in addition to that, he said - rentals that right now are being inspected by local governments, and that are required to post local contact information of property managers. Those contact sheets would have to be eliminated and replaced by state contacts, but the response would not be like it can be now. Unlike previous years, when Flagler County officials–county commissioners, the county attorney, the county administrator–routinely appeared before committees to make their case against preemption, these hearings have been Flagler-free. The issue came up at this morning’s County Commission meeting, when Jane Gentile-Youd, a Plantation Bay resident–and former commission candidate–found a new reason to add to her list of grievances against County Attorney Al Hadeed, criticizing him for not being in Tallahassee and before the committee. But the commission had made clear several weeks ago that it would not be shuttling personnel to the state capitol as it had before. Commissioner Greg Hansen said he’d sat down with Senate President Bill Galvano’s staff, who led him to believe that the county’s position would be preserved. “I think we have an advocate there,” Hansen said.